Have room for only one feeder? This one's for you! 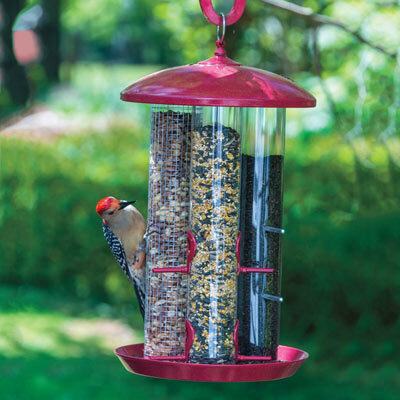 Attract a wide variety of birds by offering three different choices of food! This clever feeder will hold shelled peanuts, sunflower seed or a seed mix, and Nyjer seed (favorite of Finches, Redpolls, Indigo Buntings and Juncos) all at the same time! Accommodates both perchers like Cardinals and clingers, like Woodpeckers. Made of carbon steel with heavy-duty polycarbonate tubes, with multiple drainage holes in the base to help keep seed fresh. 17-1/2" H, 10" W.